I already own a copy of this History of the DC Universe TPB (as well as the original two-issue prestige formatted books)... but for $2 at Half Price Books, I couldn't pass it up. Tip: the coupons can be used multiple times at different Half Price Books locations. If you don't live near the book store, they offer 20% off your entire purchases by using the code GIFTS2017 on their website hpb.com. Sales ends November 12. 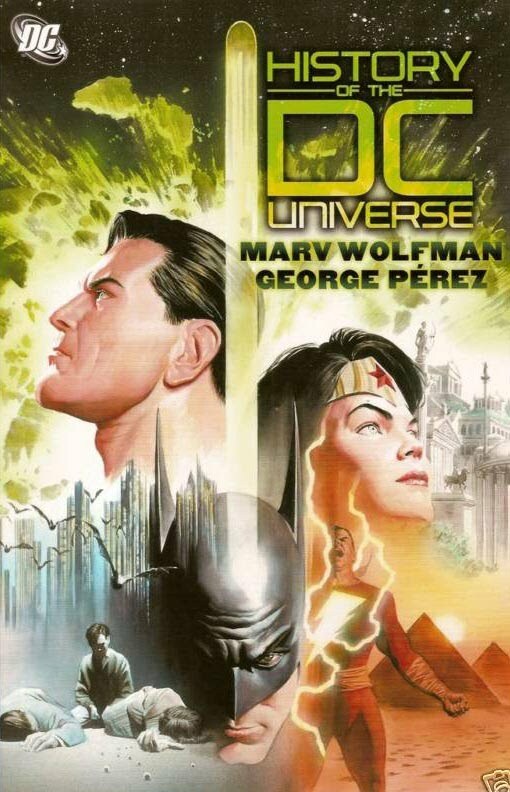 NRAMA: Now as far as the project itself goes, will be a straight time-line approach like the original two volume ‘History of the DC Universe’ that [Marv] Wolfman and [George] Perez did right after Crisis on Infinite Earths? Will it be more character driven than that project, and if so, which character, or characters will be featured? Dan Jurgens: If you look at that original history of the DCU, that was not a comic book per-say, it wasn’t presented as, ‘here are the panels and here are the word balloons.’ It was a wonderful project that was very much driven by text, with visual annotations, and was wonderfully comprehensive. If you look at the word count and the page count they had, we can’t even begin to touch on that. What we’re going to do is try to give everyone a feel for what the DC Universe was, the changes that its gone through and maybe hint at where a couple of things are going as see through the eyes of Donna Troy. She’s a character who is out there now that has connections to so many realities if you will, that have occurred throughout the DCU. It’s through her eyes that we can show everybody this is the DCU before the crisis ever occurred. This is kind of happened in and around the Crisis and this how Zero Hour affected it. Because so many readers are new to the whole thing, we can kind of take them [and older readers at the same time] through what it the DC universe was, and hopefully will be in the context of these 10 stories. 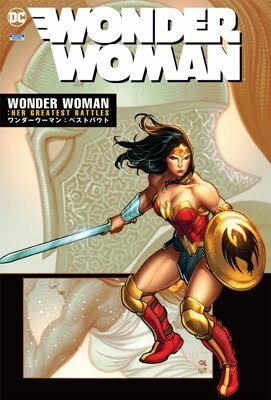 En su nuevo Crisis Counseling para Newsarama, Dan Didio sigue jugando al despiste, demostrando que no tenía nada personal contra Zona Negativa cuando respondió a nuestras preguntas de la manera en que lo hizo. Pocos datos nuevos ofrece, todos ellos centrados en 52 y poco más. Si acaso, la estructura de este macroevento semanal y las dos miniseries secuela de IC. 52 empezará una semana después de que acabe Infinite Crisis y la historia transcurrirá en tiempo real a lo largo de 52 semanas. Habrá seis (o posiblemente más) historias independientes las unas de las otras (que ocasionalmente se entrecruzarán) que buscaran acercarse a cada aspecto del nuevo DCU post-Crisis. Durante el curso de la historia se podrá ver a cada personaje de la DC con serie en curso. 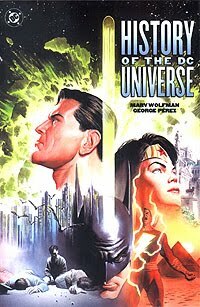 Y como extra casi cada número llevará una historia de complemento, empezando con el serial en diez partes sobre la “Historia del Universo DC”. Rubin has already come to share Hirschfield’s assessment of Ruiz. Once on board, Ruiz approached Wolfman to do the writing. The two had never met, but Wolfman’s work certainly stood out. In fact, Wolfman had teamed with artist George Perez to produce History of the DC Universe back in the 1980s. That “visual history,” as Wolfman called it, especially got the attention of Ruiz and the CFJE. They pitched the project to Wolfman, which turned out to be an easy sell. “I loved the idea and said yes,” Wolfman said. Hailing from the unimaginable era the 31st century, Korvac the Machine Man flees through the timestream, pursued by the futuristic defenders the Guardians of the Galaxy. Establishing a secret presence on present-day Earth in the persona of the mysterious unassuming Michael, Korvac contemplates the elements of a universe he thirsts to command. Yet despite the subtlety of his machinations, the mighty Avengers discover his cosmos-conquering scheme, drawing the two titanic forces into inevitable conflict. Collecting AVENGERS (Vol.1) #167, 168, 170-177. (RETAILER NOTE: This is a resolicitation and all previous orders have been cancelled). The mad Titan, Thanos, seeks to reshape the universe in the visage of his true love, death. Only the combined forces of Earth's heroes and villains stand in the way. In stores July 10. This unusual project, which spun out of the universe-changing events of CRISIS ON INFINITE EARTHS, is reoffered again! Narrated by Harbinger (a central figure from CRISIS), HISTORY brings readers back through time and space to the dawn of creation, and continues on to the end of recorded history - as Harbinger reveals "the History of Heroism." Also returning from Crisis is the oft-copied, but never equaled, George Pérez, whose uncanny ability to draw large numbers of characters in detailed, authentic fashion is truly amazing. 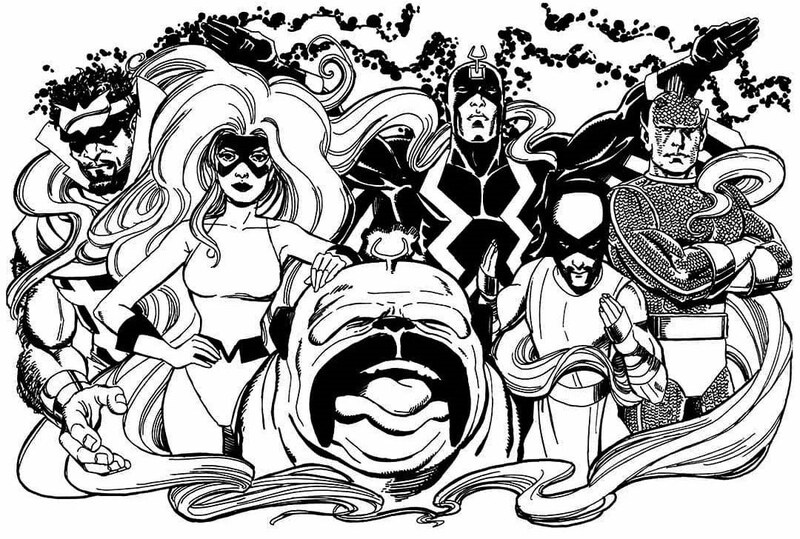 History gave the artist a break from the typical sequential art found in comics and let him draw stand-alone pictures and isolated group shots of the heroes, villains, and super-teams. While much of the history founded in these pages are outdated, and the narrative isn't as gripping as that of a good comic-book story, History of the DC Universe is, nevertheless, an interesting volume that does a nice job of providing a summary of the "history of heroism". Even better: it's a beautifully illustrated book of art. 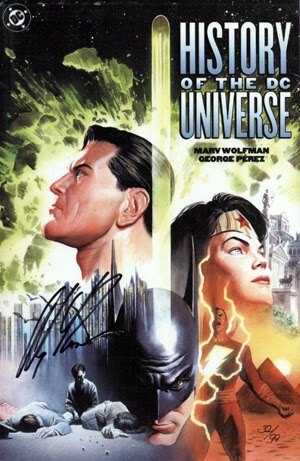 This an advertisement for HISTORY OF THE DC UNIVERSE TP, which is appearing in selected April 2002 cover dated comics. First they gave us the CRISIS. by Marv Wolfman, George Pérez and Karl Kesel, with a new cover by Alex Ross. At last, the follow-up to CRISIS ON INFINITE EARTHS is available in a collected edition this February.